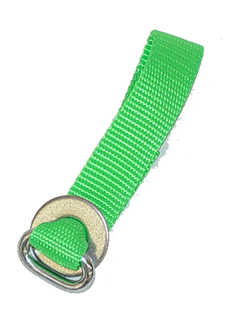 1" wide weather-resistant nylon webbing and self padded handle, quick lock buckle with spring loaded lock, and push button release. 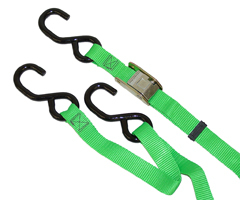 Three vinyl hooks and adjustable webbing clip. (*1200lb.). Available in black, red, bright green, purple, blue, yellow, gray, pink and forest green. 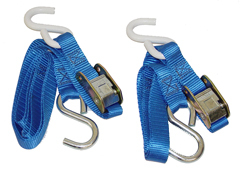 1" wide weather-resistant polypropylene webbing and self padded handle, quick lock buckle with spring loaded lock, and push button release. Vinyl coated hooks, plated hardware to resist weather. Sold in pairs. (*1200lb.). Available in black, red, bright green, purple, blue, yellow, gray, pink and forest green. Securing aid for personalized watercraft.